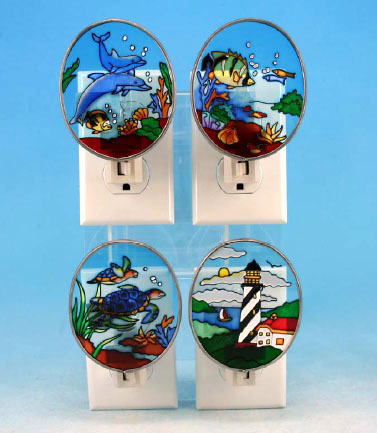 Stained Glass Nautical Nightlights in four assorted designs. These exclusive nightlights are made out of stained glass with a stunning detail finish. Handcrafted with the finest details and materials, this piece of functional artwork will bring a lifetime of enjoyment. A wonderful gift for a friend or loved one as well! Stained Glass, 3.75" W. x 3.75" H.